Duncanville is proud to announce a new Neighborhood Event Trailer to help strengthen relationships in neighborhoods by fostering opportunities for community gatherings. The Event Trailer is stocked with tables, chairs, ice chests, backyard games, karaoke machine, barricades and other supplies to help make neighborhood events a success. 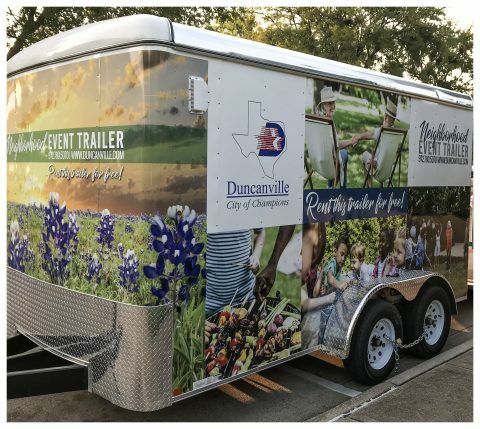 The City of Duncanville City Council has established a goal of making Duncanville the most engaged community in America, and the Event Trailer supports a wonderful way for citizens to get to know neighbors. Best of all, the trailer is FREE for use for Duncanville residents! The Neighborhood Event Trailer may be reserved once per weekend and is available to Duncanville residents for public/neighborhood events in Duncanville only. The Event Trailer will be delivered on Friday before the event and picked up on Monday. The Event Trailer is free; however, the person making the reservation is responsible for the return of all contents in a good working condition. All reservation requests must be made at least 3 business days in advance. Click here for the Event Trailer Guidelines. Error: Error validating access token: Session has expired on Saturday, 09-Feb-19 14:28:37 PST. The current time is Friday, 26-Apr-19 04:48:14 PDT.